NEW BRITAIN - For the second time in school history, the Innovation girls basketball team has qualified for the postseason. 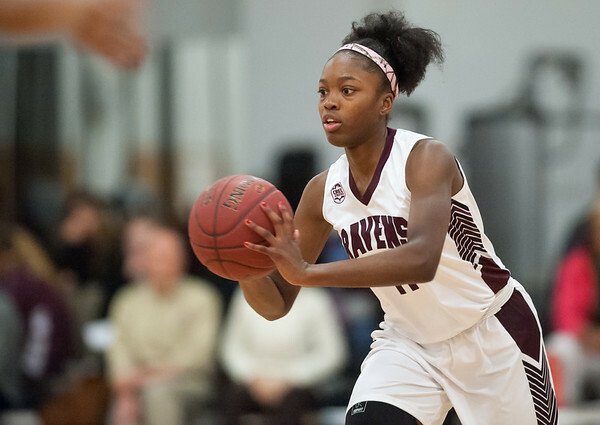 The Ravens’ 41-25 win over Public Safety Tuesday evening, secured their spot, as Innovation collected its eighth win of the season. What really helped the Ravens were their 19 free throws. “Any team that scores 19 free throws is going to win the game,” Jessie said. Katerina Rodriguez led Innovation with 11 points while teammates Bailee Nardee and Aryanna Townsend added a combined total of 17 points. The Ravens are now 8-11 on the season. In their most important game of the season, the Gladiators managed to come out with a win. Goodwin Tech is now heading back to the postseason after securing its eighth victory in its season finale. Paola Barbosa scored a game-high 15 points for the Gladiators as Joarielys Martinez added eight points of her own. In what was a back-and-forth game for much of the night, Goodwin Tech got a strong defensive effort in the final quarter to put the game away. New Britain 39, Wethersfield 52: The Hurricanes wrapped up what has been a tough season Monday evening. Brianna Clarke led New Britain with 12 points while Mya Slisz added 10. Rocky Hill 47, Newington 42: The Indians ended their regular season Monday evening (9-11) in loss to Rocky Hill. Luckily for Newington, it already claimed its spot in the postseason. Abby Flores led the team with 13, while Ashanti Frazier and Maya Gajowiak each added 12 points. The Indians will have a chance to fine tune some things before the Class LL state tournament as they’ll compete in the CCC Tournament this week. New Britain 68, Rocky Hill 43: It was a game the Hurricanes controlled from the very beginning and was over by halftime. Jahfari Newman led New Britain with 15 points while Kaiyon Gunn added 12. Malik Shode and Maurice Turner both contributed eight points each. The Hurricanes are now 13-5 on the season and will continue into postseason play, first in the CCC Tournament and then the Division II state tournament. Maloney 65, Berlin 57: It isn’t quite the way the Redcoats are looking to wind down their regular season. But Berlin knew it was going to be in for a tough test against a Spartans team fighting for its playoff life. Gianni Fanelli led the Redcoats with 18 points while Mike McCarthy added 15. Maloney, however, pulled away in the second half. Romello Samuels led the Spartans with 25 points. Berlin will next play Hartford Public on Thursday. Goodwin 88, Wolcott Tech 40: The Gladiators are looking to head into the postseason on a strong note. Goodwin Tech certainly helped its case against Wolcott Tech. Josh Peeples led the Gladiators with 21 points and Luis Aguiar added 20 as the team picked up its 15th win of the season with two games remaining. Goodwin Tech will play again on Thursday as it faces Wilcox Tech before hosting Innovation on Friday. Innovation 50, Public Safety 37: The Ravens bounced back after losing their last two games. Malcolm Lewis led Innovation with a game-high of 15 points while Remeish Bogle added six to send the team;s eight seniors out with a win in their final home game. The Ravens controlled the game from the beginning and never looked back. By halftime, the game was well out of hand for Public Safety. Innovation is currently 12-7 on the season and will face off against Goodwin tech on Friday to wrap up its regular season. Posted in New Britain Herald, Berlin, Goodwin Tech, Innovation, New Britain, Newington on Tuesday, 13 February 2018 23:06. Updated: Tuesday, 13 February 2018 23:22.